We offer many different e-commerce gateways in Event Wizard® when it comes to collecting fees from your registrants. However, some users prefer to use PayPal, so here’s a quick rundown on how to set it up in your event. The first step is to enable PayPal in your event’s payment process. To do this, head to the orange section of your event task list and select “Edit your payment options and details”, as seen above. On the page that opens up, you’ll notice the PayPal panel on the right side. In the first box, enter the email address associated with your PayPal account. Then, under Item Name, enter something relevant to your event/fees. This will be the name that appears during the PayPal checkout process for this event. While it’s not required to enable IPN, we strongly recommend doing so. If you don’t, you’ll end up having to manually check your PayPal transactions on a daily basis and manually flag each successful transaction as Paid in your Event Wizard® attendee database using the Event Wizard Reports. It is a huge time-saver, especially when it comes to higher transaction volume. There are a few more steps on how to check your transactions and test your IPN integration, which we have compiled into a quick-reference PDF for your convenience. As always, if you have any questions regarding PayPal integration or anything else in Event Wizard®, you know where to find us! 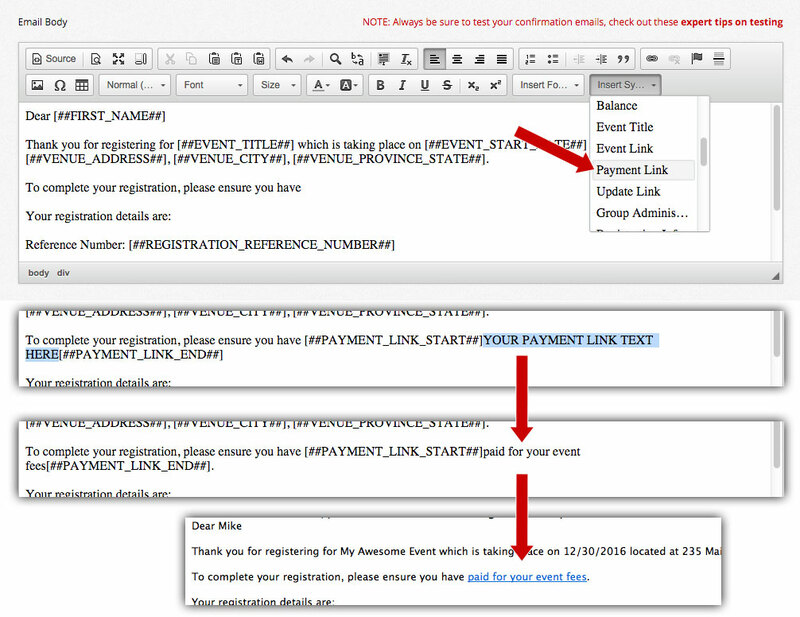 Emails can be found all over Event Wizard®, like the ones that are sent automatically when someone registers/pays for one of your events, or sent manually using the Mass Email tool in your event’s reports section. While you can’t directly attach files to these emails, you can easily create a link to the file using your online file hosting space, which is included with every Event Wizard® account. The first step is to navigate to My Files in Event Wizard®, which can be found in the main menu at the top of every page. From here, you can either click the Upload button and choose a file local to your computer, or simply drag-and-drop it into the browser window. You will likely notice a progress bar at the bottom of the screen as your file is uploaded; the speed of which will depend on the file size and the speed of your internet connection. Once the uploader has finished doing its thing, you will see your new file in the list. For this example, we are going to use the Registration Confirmation Email. Now that you have uploaded your file, head over to your event’s task list, open up your Edit registration confirmation email page and scroll down to the editor. 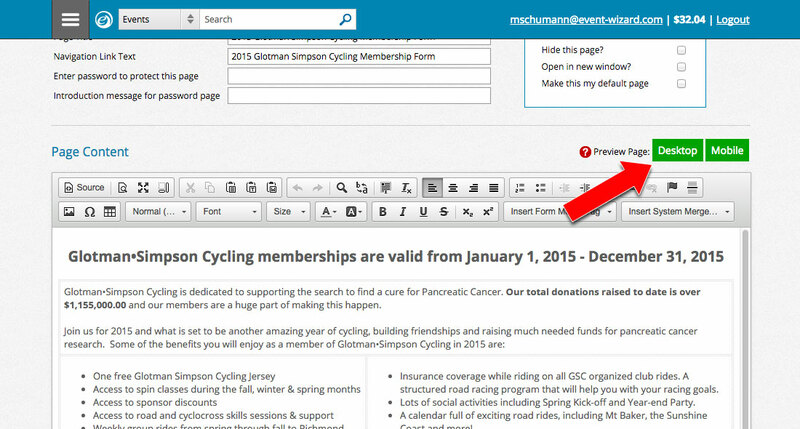 Highlight the text into which you’d like to insert your link and click the Link button in the editor’s toolbar. In the popup that appears, click the Browse Server button, which will open up your list of files in a new window. Locate your newly-uploaded file in the list, (likely near the top) and click the file name to close the window and insert the link into the URL box. NOTE: Some older email clients require that you set the Target of your link to open in a new window. To do this, click the Target tab at the top of the popup and select New Window (_blank) from the list of options. Click OK to confirm, then click Save to lock in the changes to your email contents. That’s it! Now, when someone receives this email, the embedded link will allow them to download the linked file from your Event Wizard® storage. You can also use this method when linking to files elsewhere in your event; to an agenda PDF on your Welcome page, for example. As always, if you have any questions about this or anything else in Event Wizard®, please check out our Help Centre or drop us a line. The reporting system in Event Wizard® is very powerful and feature-rich. Not only does it give you a full overview of your event’s progress, it also allows you to manage your registrants in just about every way imaginable. One particularly useful reporting feature is the Excel download function, which allows you to download an Excel-compatible file containing the report of your choice. Finally, choose Comma as your delimiter and click Finish. Follow the same steps as the PC instructions above, but instead of using your .csv and UTF-8, (in step 3) choose your new .txt file and Macintosh as your File Origin. Regardless of whether you’re on a Mac or PC, the import window in Excel provides a preview of what your data will look like once imported. If for some reason the above steps don’t work for you and you’re still getting strange looking characters in your preview, try different encoding/file origin types until you find the one that works for your setup. You can then use your new spreadsheet as is, or you can download in a variety of file types by clicking File > Download as. Hopefully one of these methods will help you deal with special characters in your report downloads. As always, if you have any questions about this or anything else in Event Wizard®, please drop us a line. Group registration is a vital tool for a lot of our clients, which is why we have developed one of the most powerful group registration systems in the industry. When utilizing group registration, sometimes our clients want to offer discounts based on different scenarios – this is where group rules come into play. Below are six example scenarios of where group rules can help automatically apply discounts to your event fees. Say you want to offer a bulk discount to all members of your group. In this scenario, the discount will only be applied when the 10th group member registers and will be applied to all members of the group. If any more than 10 people register for the same group, the extra registrants will not receive the discount. This scenario is similar to the “buy one, get one free” deals sometimes seen in your local department store. More specifically, this example is a “buy 5, get 1 free”, where the 6th registrant in a group gets a discount of 100%. Similar to the first example above, this one applies a discount to all group members. Where it differs is that it will continue to be applied to group members, even after it hits a certain threshold, (in this case, 3 members). This one is useful for rewarding group members for early registration. In this example, we are applying a 25% discount to everyone in a group, (minimum of 2 people) who registers before a certain date. If anyone is added to the group after the early-bird fee expires, they will not receive the discount. It should also be noted that you need to set up your fee with an early-bird rate in order for this to work properly. Say you are trying to fill tables at a banquet that hold a maximum of 6 seats, but in order to fully cover the cost of the table you need 3 or more people at each one. The discount in this scenario doesn’t get applied until after you have hit your 3 seat minimum, but will encourage people to fill the tables to their capacity of 6. Note that you would need to set your max group size to 6 as well. This is another useful one for banquets or dinners. Say you’re selling two different ticket tiers: single seats, and full tables of 8. You can set a group rule to apply a 100% discount to all but the first group member if they purchase a full table. That way, the group administrator, (first person registered per group) will essentially pay for all group members that follow. This is especially useful in scenarios where the group administrator is not only paying for, but also registering the rest of the group members. Note that you would need to set your max group size to 8 as well. These are just six examples of how you can utilize group rules, but the possibilities are pretty much endless. Keep in mind that you can apply these rules at any time, even if your event is already open. And group rules are smart – they know when someone has cancelled from the group and will re-apply the rule to the new group. If you have any questions about group rules, drop us a line. As an event coordinator, you want your event to go smoothly from start to finish. The last thing you want to be doing is chasing your registrants down trying to collect missing payments, but it does happen from time to time. Not to worry, we have compiled three tried and tested methods to help you collect any outstanding payments from your registrants. It’s possible that one or two registrants simply missed the payment buttons on their confirmation, (i.e. : “thank you”) page; emailing them a quick reminder is the easiest way to get them back on track. 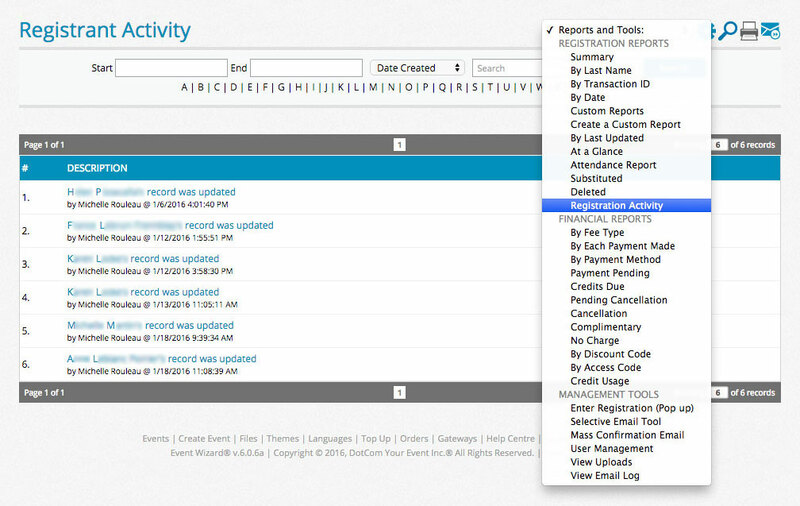 Open up your event reports and locate the name of the registrant in question. Click the View the Registration Details icon in the Tools column for that registrant, which will open up their confirmation page in a new window. 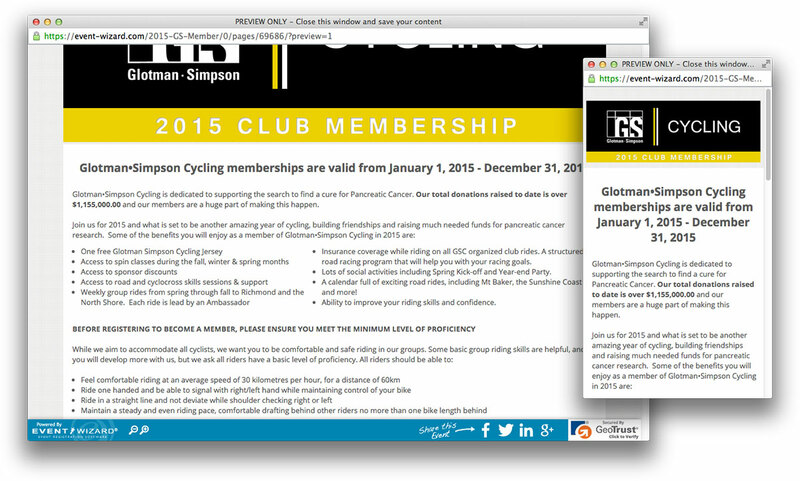 Copy the URL from the address bar of the popup and paste it in an email to your registrant. Once received, they can click the link to come back and make payments using the methods you have enabled in your event. Note: If you only have online payment enabled, simply replace the /thank-you/ portion of the URL with /checkout/. By sending them this link instead, they will open up directly to the checkout process rather than their confirmation page, saving a step. Rather than waiting for any missed payments, you can take a preliminary measure by including a personalized payment link in your registration confirmation email. This is done using the Payment Link system merge tag, which uses your registrant information in Event Wizard® to generate a personalized link for each individual registrant. When editing your registration confirmation email, click the Insert System Merge Tag dropdown in the editor, and select Payment Link. This will insert the payment link merge tag wherever your cursor is placed within the body of the editor. The link merge tags work similarly to how <a> tags work in HTML: they consist of the opening tag, link text, and closing tag. In this case, the opening and closing tags make up the portion of the merge tag that is automatically created by the system, so you don’t need to worry about that. The portion you need to concern yourself with is the link text, which should be changed to something more relevant, (such as “Click here to pay for your registration”) so the registrant knows what the link represents. The screenshot above shows the different steps from link creation to the final email. If you have a lot of registrants that have outstanding payments, you can use the email tool within the reports to easily send every one of them a personalized email reminder. 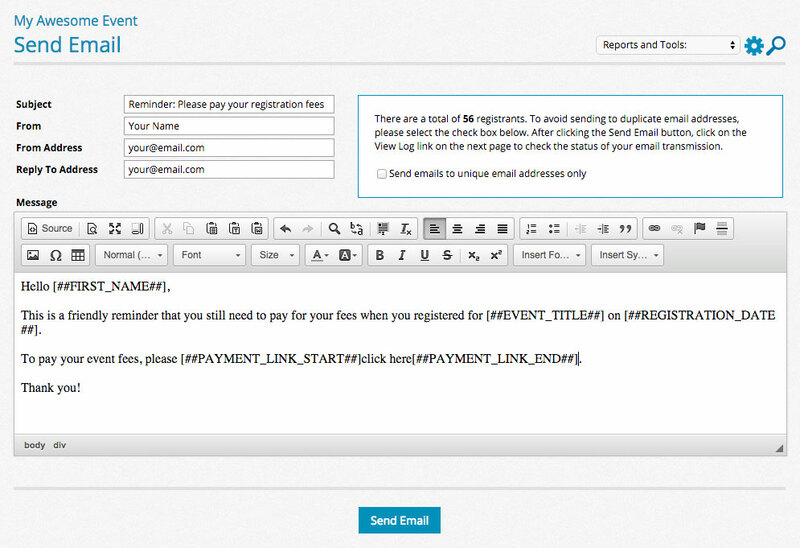 Start by going to your event reports and opening the Pending Payments report. 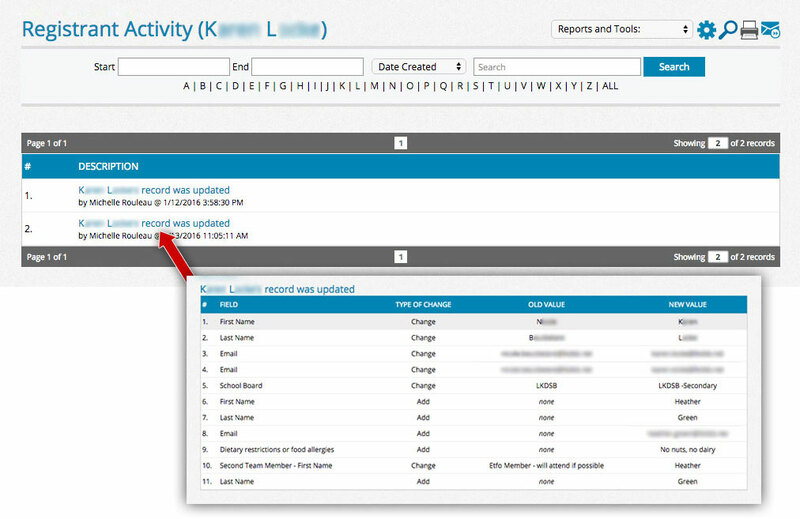 Locate the Email icon beside the Reports and Tools dropdown – give it a click. On the page that opens, you will notice a lot of the same fields from the Edit Confirmation Email page. Start by filling in the boxes with your subject, name, and email address. Next, add some content to your email. Composing your reminder email is just like composing the confirmation email we did in method 2, only with slightly different information. You can use merge tags to personalize the email with information like the registrant’s name and registration date, but most importantly, their payment link. Once you have your email composed, click the Send Email button. Hopefully one of these methods will help you to collect any pending payments for your event fees. If you have any questions about this, or anything else Event Wizard®, please contact us. You asked and we listened! The date input field type has been a part of Event Wizard® for a long time, but it wasn’t very flexible and was due for an overhaul. 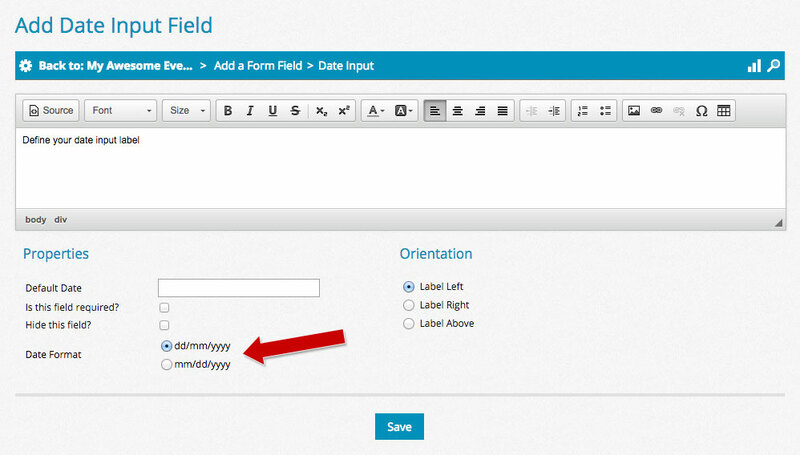 Thanks to suggestions from some of our clients, we have added some much-needed functionality to the date input field. When a date input field is added to a registration form, it is rendered as three dropdowns: Day, Month, and Year. Until now, these dropdowns always appeared in a static order and couldn’t be rearranged. This wasn’t ideal, since different countries format their dates differently, so we added an option to arrange them as Day/Month/Year or Month/Day/Year, as seen in the example below. Choosing whether your date input field appears as Day/Month/Year or Month/Day/Year is easy, and can be done using the new Date Format property when adding or editing your date input field. Due to the way the date input fields functioned, they were always required to have a default date. This meant that even if a registrant didn’t explicitly fill out the field, the default date was always present in their response. We completely rewrote the date input field’s functionality from the ground up, which provided us with the option of allowing empty date fields on forms. Because of this new feature, the only time registrants are now forced to enter a date is if the date input field is specifically marked as “required” by the event organizer. Awesome! We hope you find these enhancements useful when building your next event. If you have any feedback or requests, please take 5 minutes and fill out our Event Wizard® Feedback survey. Who knows, you might just see your suggestion(s) in the next version update of Event Wizard®! Often times our customers have certain requirements when it comes to processing fees for their online registration. One such requirement is tax-exemption, which can include GST, HST, or PST/QST. Once we have received this, we will process your request. If you have any questions about this process, or anything else, please give us a shout.